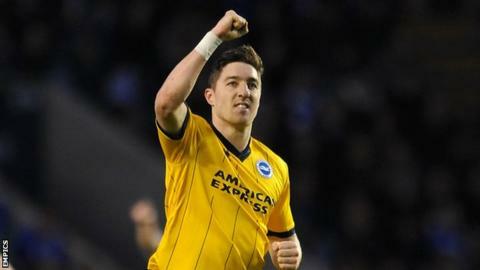 Brighton defender Stephen Ward says his future will be decided in the summer. The 28-year-old has made 40 appearances for the Seagulls since joining on a season-long loan from Wolves in August. The left-back told BBC Sussex: "These things always happen in the summer. It's not something I want to worry about until the season is finished. "My main focus is on getting us into the play-offs. Whatever will happen in the summer will be up to Wolves and people in the background." The Republic of Ireland international has one year remaining on his deal at Molineux but has not had any contact from the League One leaders in recent weeks. "I'm sure they are concentrating on getting promoted," he said. "I've had a really good year down here and really enjoyed it. I'm an Albion player at the minute and enjoying my football." Brighton are now two points off the Championship play-off places after ending a five-match winless streak with a 4-1 victory at Leicester on Tuesday. "To still be in with a chance is pleasing," Ward added. "A couple of weeks ago people were saying we were out of it. The win has propelled us back into contention. "We believe we are good enough to be in the play-offs and we are disappointed we are not further up the table." The win at already-promoted Leicester was the first time the Sussex club have scored four times in a game this season and Ward hopes that performance will boost their confidence for the remainder of the campaign. "Over the last couple of weeks it has been tough but it was probably one of the stand-out performances of the season," he said. "It was pleasing to go away from home and win convincingly. Hopefully it can set us up for the last five games of the season. "Sometimes it is more difficult against teams who come to the Amex who tighten up. It is something we need to work on and make sure we have a new dimension in our game to overcome that."